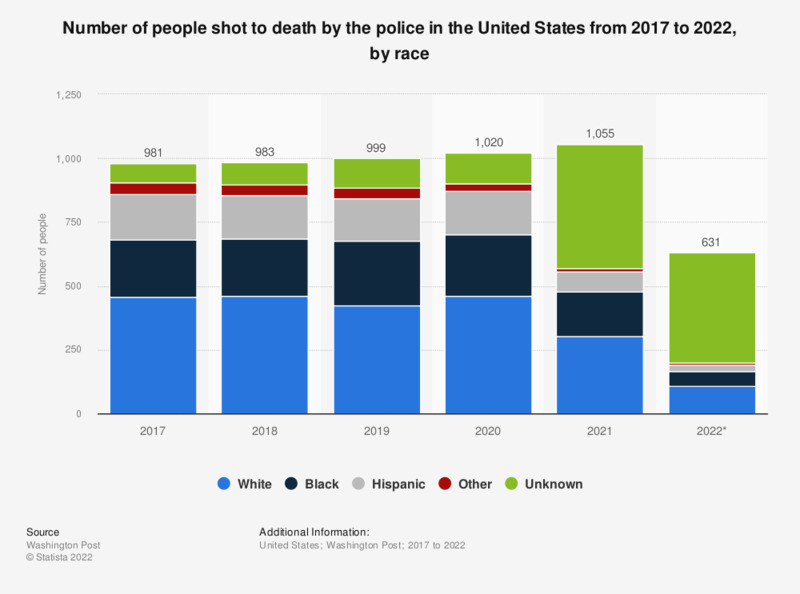 Sadly, the trend of fatal police shootings in the United States seems to only be increasing, with a total 239 civilians having been shot, 31 of whom were Black, as of March 20, 2019. In 2017, there were 987 fatal police shootings, and in 2018 this figure increased to 996. In recent years, particularly since the fatal shooting of Michael Brown in Ferguson, Missouri in 2014, police brutality has become a hot button issue in the United States. The number of homicides committed by police in the United States is often compared to those in countries such as England, where the number is significantly lower. The Black Lives Matter Movement, formed in 2013, has been a vocal part of the movement against police brutality in the U.S. by organizing “die-ins”, marches, and demonstrations in response to the killings of black men and women by police. While Black Lives Matter has become a controversial movement within the U.S., it has brought more attention to the number and frequency of police shootings of civilians. * Data for 2019 is as of March 20, 2019. Statistics on "Security sector in the Netherlands"
Are you for or against a common defense and security policy among EU member states? Do you agree with the statement: "By 2024, the Dutch defense budget should be two percent of GDP, as promised to the NATO"?